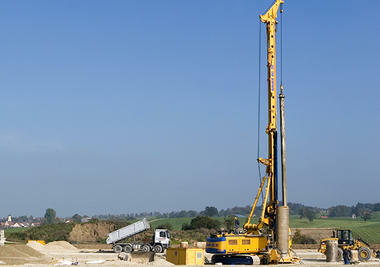 Pile-driving and drilling machines must function reliably. When used outdoors on building sites, the swivelling joints of the leaders and the bearing positions on the swivelling joints are subjected to harsh conditions, such as high temperature fluctuations, moisture and dirt. When pile-driving, impacts and shocks subject the bearing position to stress. KS PERMAGLIDE® P20 plain bearing bushes. Two KS PERMAGLIDE® P20 thrust washers sit between the arms of the joint. The plain bearings compensate for misalignments in the roughly welded joints. The polymer sliding layer of the material KS PERMAGLIDE® P20 is insensitive to high edge loading. When used with a grease lubricant, the plastic in this application has good damping performance when subjected to vibrations and impacts. This means that the impacts are diminished by the time they reach the hydraulic excavator. By using the KS PERMAGLIDE® P20 plain bearings, the bearing functions reliably despite the difficult operating conditions. KS PERMAGLIDE® P20 is a low-maintenance, high-performance leaded bearing material. The material is designed for greaselubricated or liquid-lubricated applications. This composite, multi-layered material excels thanks to its high rigidity, durability and resistance to oscillation and vibration. These characteristics are largely achieved by a sliding layer system made of polyvinylidene fluoride (PVDF), polytetrafluoroethylene (PTFE) and lead. The wear-resistant material has already proven itself many times in industry. The standard P20 version features oil distributing pockets as per DIN ISO 3547. The bearings are provided ready to install for recommended connection-design installation dimensions. Also available are versions with a different wall thickness, suitable for rework when installed, or with a smooth sliding surface for hydrodynamic applications. boring machine is mounted on a telescopic leader. The leader is attached to the outrigger of the hydraulic excavator. The hydraulic hammer or boring machine runs up and down the leader. The link piece between the leader and excavator takes the form of an articulated bearing. The leader is straightened laterally by free swivelling motions in this way. Joint bearings are articulated bearing elements based on plain bearings. Joint bearings allow swivelling motions, rotary motions and tilting motions and transfer static and dynamic forces. Maintenancefree joint bearings or joint bearings that can be re-lubricated are used depending on the application. We will be happy to receive your direct enquiry.